Now, I don't know if these are real. My mother's father gave these to me because "every girl should have pearls". I honestly don't remember when. It seems like I've always had them. I'm thinking I was about 6 years-old. Maybe my mom, who reads the blog, remembers. And did my sister get a set? It might have been the year she was born. These have passed into what might be considered "antique" status, I've had them so long. 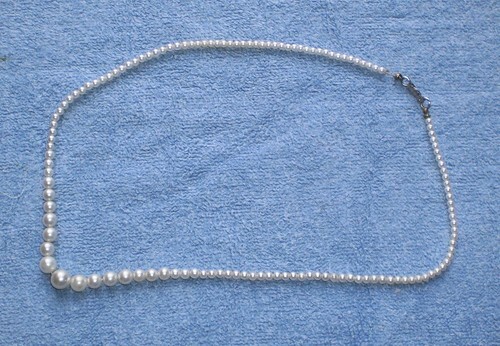 This is the original clasp and stringing. I just don't find an occasion where I need to wear pearls. Carole is going to wear them for her "blessing of the vows" ceremony. I am honored and I know my grandfather would be, too. You can tell if pearls are real by rubbing them on your teeth. Glass will feel smooth, real pearl will feel coarse. I've heard that but I can't tell.